Follow the steps to create an app in Ionic Creator that hooks into a real world API for dynamic data. Let’s begin by discussing the type of application we’re going to build. It will be a simple “Master/Detail” example where the initial page is a list of items and the detail provides - well - detail. 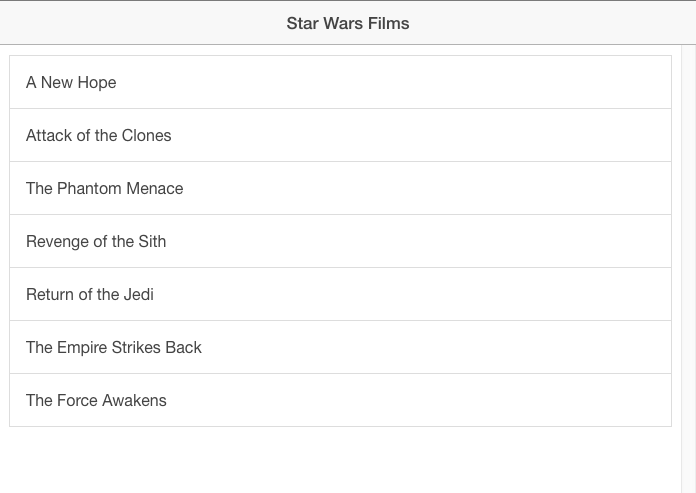 As a completely random “not related to anything recent” idea, let’s use Star Wars films for our data. 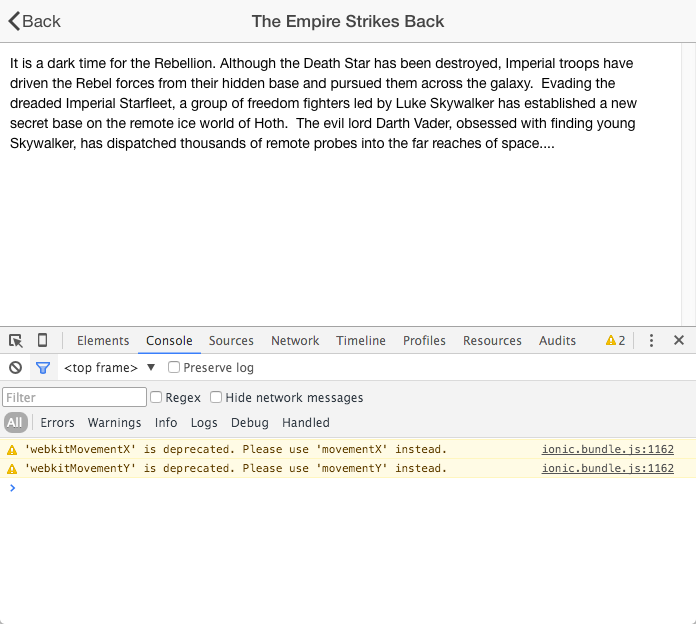 It just so happens that an API exists, SWAPI, that provides information about Star Wars films. In fact, I’ve already released a helper library for this API: SWAPI-Wrapper. We won’t be using that helper in this blog post, but just remember it if you decide to actually use this data in a real application. 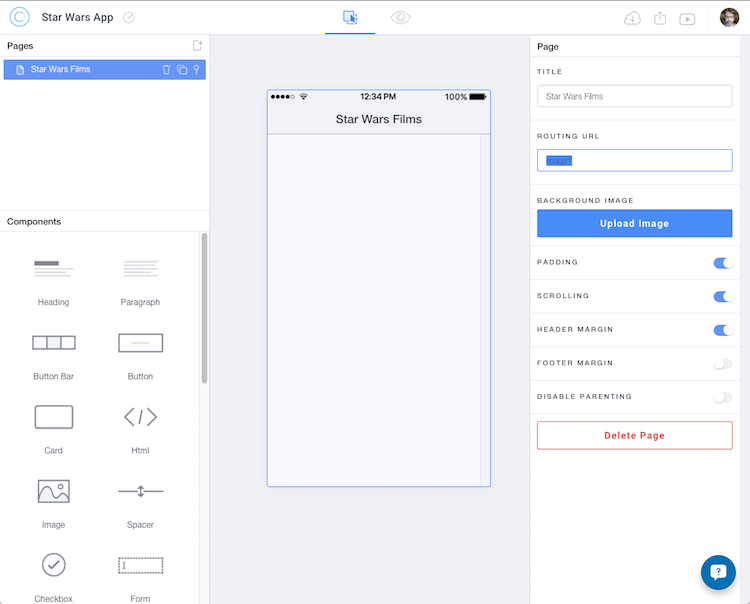 We’ll start off by creating a new application in Ionic Creator. Remember that this is 100% free to try. You only need to pay if you want additional projects. (You can find more detail on their Pricing Page). 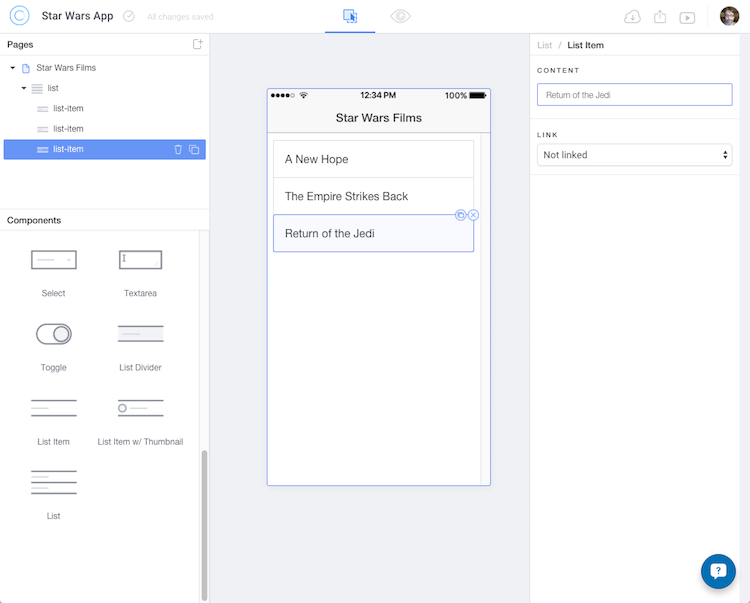 This will drop you into the editing interface with a blank page. On this page, we’ll do two things. 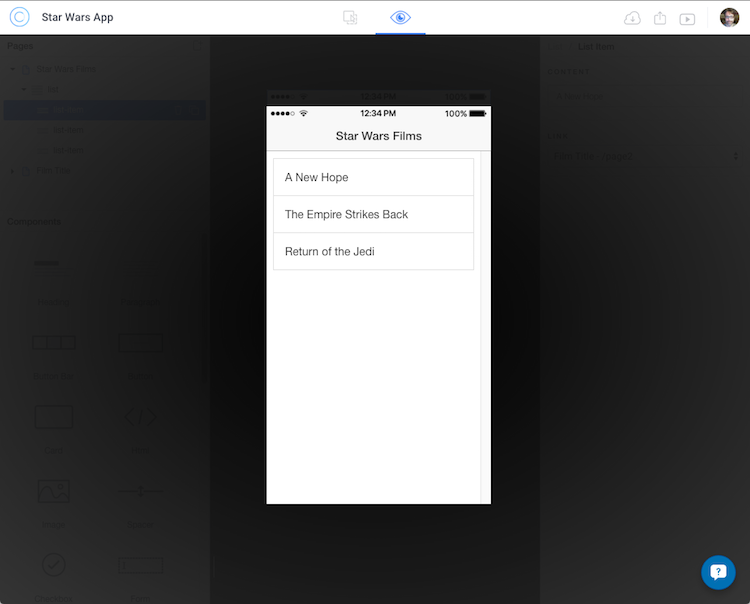 First, we’ll edit the title to give it something that makes sense for the app. Notice how it adds 3 list items automatically. If you want, you can remove some, or add some, but for now, three is just fine. If you click each one, you can give them a unique text value. While not necessary, I’d go ahead and do that just so you mentally keep in mind what we’re actually building. For now, let’s just use a bit of static text. Drag the Paragraph component onto the page and then edit the content to be something that describes the purpose of the text block. Now let’s hook up the list from the first page to the detail. 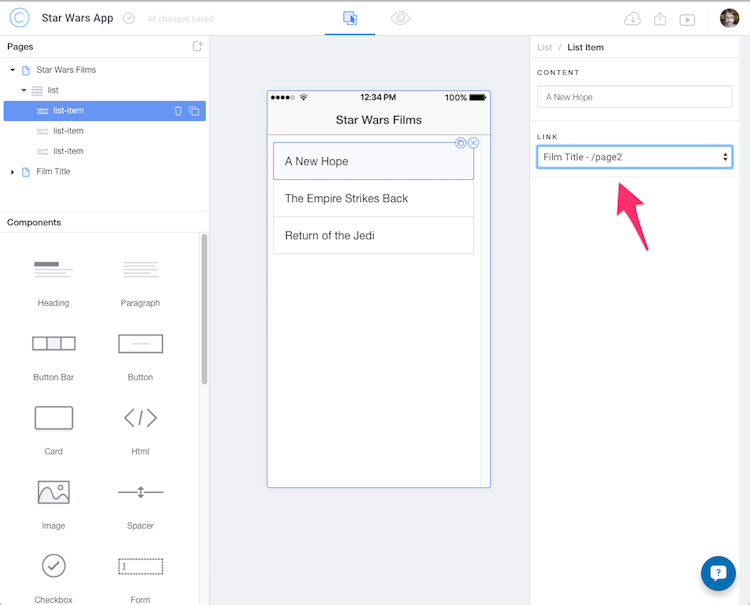 Now, in the real application, each list item would link to a page showing different text based on the selection. However, the dynamic aspect will be handled by code we add later on. 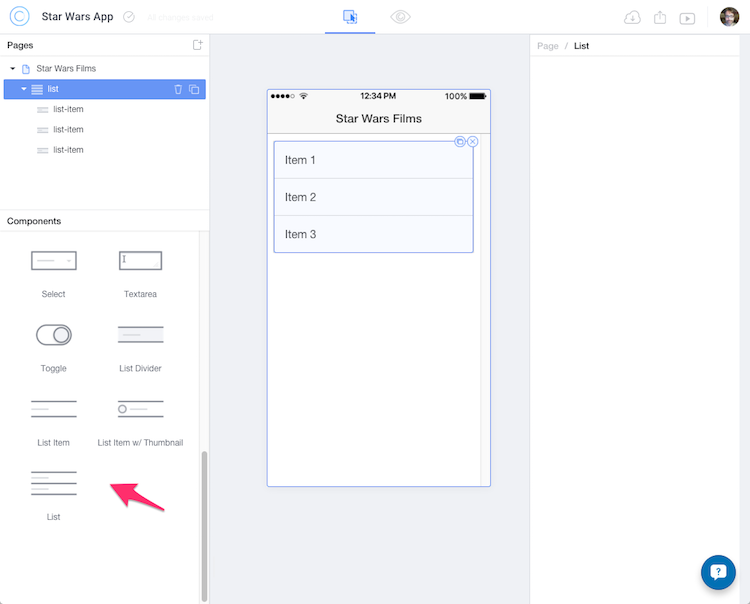 If you were to demonstrate this dummy app to a client, you may need to make 3 distinct pages so they don’t get confused. If you do, don’t forget that you can select the page in the left-hand nav and click the “Duplicate” icon. For now, click back to the first page, and select the first list item. Note that you can now select a link that points to the new page. Go ahead and do that for all three list items (and again, you don’t really need to) and then click the Preview icon on top to test out your beautiful, if fake, application. Woot! We’re done with the prototype! Ok, so at this point, we’ve got a working prototype. The first thing we need to do is get a copy of the code. 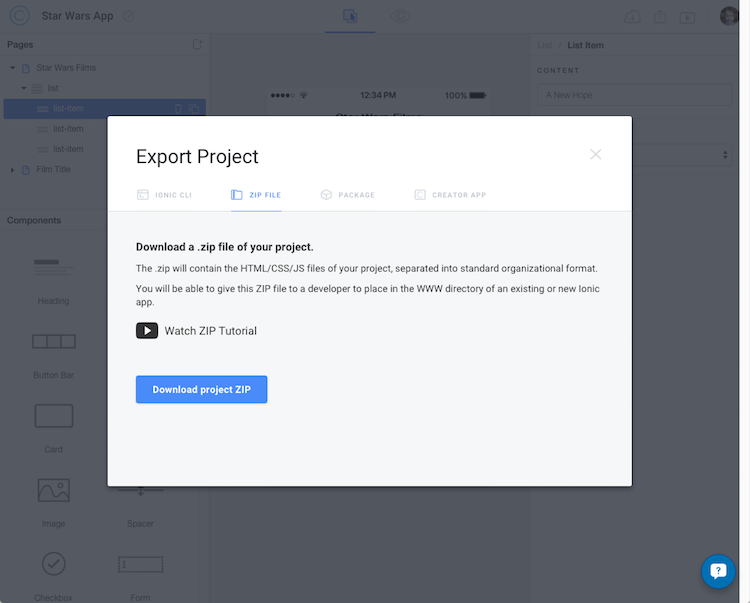 You can use the Export menu option to open a window showing you four different ways of working with the code. I recommend using the Zip File. While we can create a new application from the code of the prototype directly with the CLI, I think it would be nice to have a copy of the prototype locally to compare and contrast while working on the new version. The “v1” part there is the name of the subdirectory. As you can guess, we’re going to iterate a bit from the original Creator version to our final version. Why? We currently have a static version of the application. It doesn’t use any “real” data. 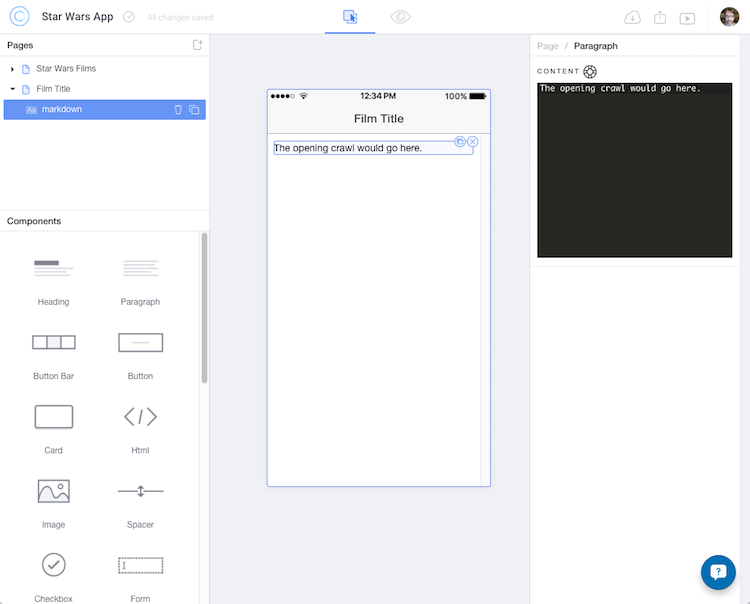 Our first iteration is going to make the application dynamic, but it is going to use fake, static data. Ok, that probably sounds confusing. Let me explain again. Right now, our list of films is a hard coded list of 3 films. We’ll begin by removing two of the ion-items and making the third dynamic. Now let’s look at the controller. 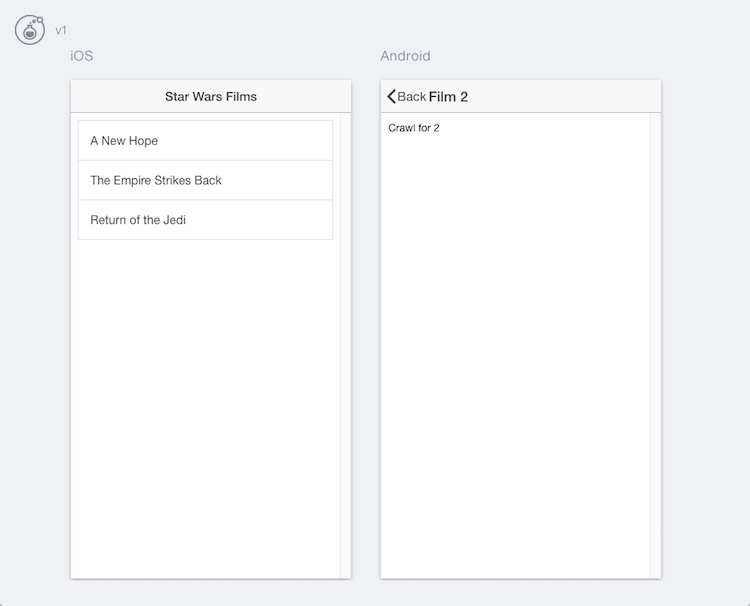 By default Creator made a blank one for us called starWarsFilmCtrl. We need to edit this to work with data. Ok, so what in the heck is FilmService? We haven’t written it yet! Basically, we’re setting up the controller to work with a service we’ll write later that’s going to return our array of data. Note we use $scope.films to set the initial, empty array. We can then call the service and set the result. Why did we switch to ion-nav-title? See this blog post for an explanation. Basically, we need to use that directive to handle dynamic titles. Ok, so now let’s go and update the controller. So let’s quickly review what we did here. 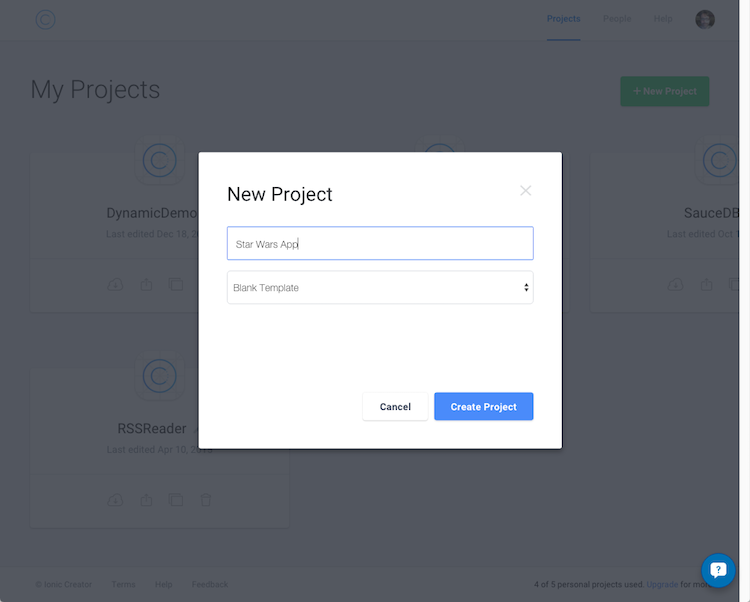 We updated the completely static application to be partially dynamic. Both the initial page (the list) and the detail are now dynamic. The controller speaks to the service to ask for data, returns it and makes it available to the templates. The data itself may be static, but every other aspect of the application is now dynamic! Woot. If you want, edit the services file to add a new film. When you reload, you’ll see the new item show up. Alright - so in theory now the only thing we need to do is update the services file to use SWAPI. In theory. As I kind of alluded to before, we’re going to run into a small issue but that’s ok - we’re professionals and we can handle it. Using SWAPI is pretty easy (and you can read the docs for a full explanation), so let’s begin by making the call to get films use real data. However, clicking to the detail won’t work. Why? The SWAPI doesn’t actually return an “id” value. Notice the console.dir on the results in the code snippet above? It’s currently commented out, but if you remove the comments, you can see the data yourself. This is also fully documented as well. Obviously, every application will be different and our API was especially simple, but I hope this demonstration was useful. If you want to look at the code, you can find it here: https://github.com/cfjedimaster/Cordova-Examples/tree/master/statictodynamic. As I said, please let me know if anything didn’t make sense. You’ve read the post, now watch the video! Sharp readers may notice that the initial getFilms call actually returns all the data. We could make the application better if we stored that data in the service. Calls to getFilm would just return the appropriate portion of the stored data. What's cool is we can make this modification in the service and nothing else needs to change. This is basic MVC architecture stuff, but again, for folks who may be new to development, this is exactly the reason we use setups like this. It allows for optimizations later that are confined to one file and don't break other parts.